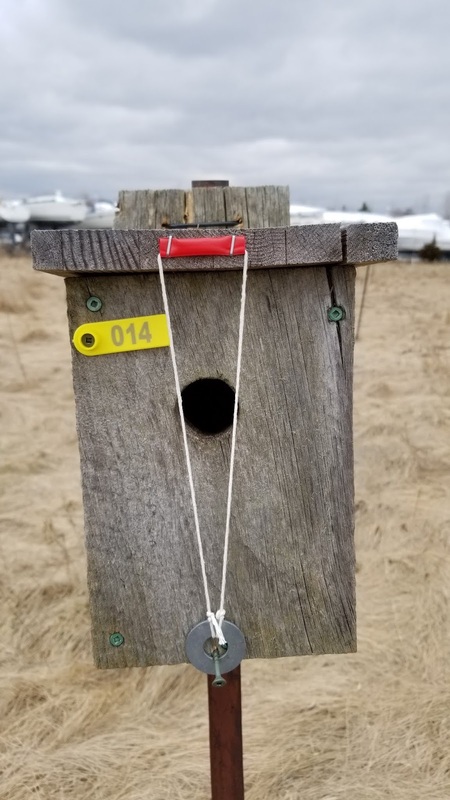 The first Tree Swallows of the season were reported in the Swallow Field last week. Bruce Wilkinson, Walt Balenovich, Stephan Baker and Terry Smith sprang in to action at the weekend and set about cleaning them out, repairing and sanitizing them to get them ready for their new guests. We are happy to report that there was virtually no vandalism this year and that 64 boxes are all ready to go. We have become aware of an increasing number of House Sparrows occupying the nest boxes. 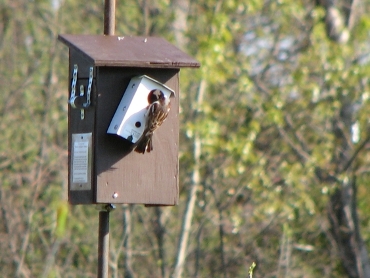 It is not always easy to identify which box was used by House Sparrows. Although their choices of nesting materials are quite different (swallows – low profile, always white feathers; sparrows – high profile, dry grasses), because the stronger and more aggressive House Sparrows will build on top of an already started swallow nest, we cannot be absolutely sure of exact numbers. Our estimate is around 10 to 15% sparrow occupancy and probably increasing annually. to 56 in the Swallow Field and 91 to 98 east of the yacht club. We are asking the public to let us know when they observe House Sparrows entering or leaving boxes, not just sitting on top, to let us know the number of the box and the date of the observation. Reports can be sent to Terry Smith at tm.smith@bell.net. This “citizen science” initiative will give us a more accurate record of the exact rate of successful competition. 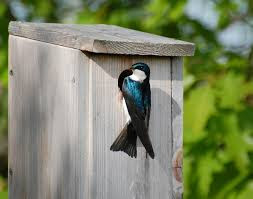 This invasive, introduced species’ occupation of Tree Swallow nesting boxes is a widespread and growing problem. House Sparrows are heavier, stronger and more aggressive than Tree Swallows and will quite readily kill nestlings to stake their claim. In previous years, we have tried clearing out sparrow nests as soon as we know of them but they start building again immediately. This year, we are trying some homemade solutions. 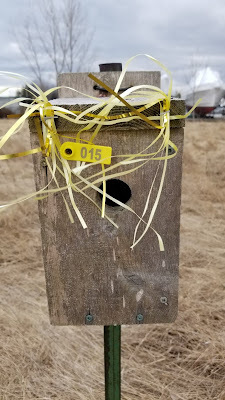 The yellow tinsel on some of the boxes is not actually an Easter greeting for our tired travelers but an attempt to deter House Sparrows. You may see in the next few weeks other DIY ideas being tested. If you have any ideas or you have any suggestions, please contact Terry. 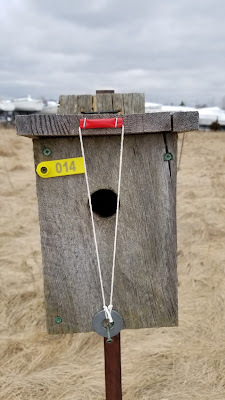 successful anti House Sparrow deterrent is the Hironbec Pendelum, an ingenious device manufactured and distributed by a Quebecois inventor. 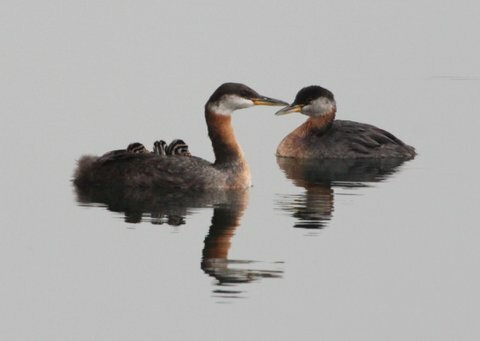 It operates by closing off the entrance hole to a bird that weighs more than that of the desired species. House Sparrows weigh about 28 grams while the swallows weigh about 20 grams. Unfortunately, because of its intricate design, they are expensive and beyond our ability to try out at this time (about $25 apiece for a bulk order, $35 for singles). To learn more, check out this video.